Although Exeter is famous as a Roman city it was occupied by the Iron Age Celtic tribe of the Dumnonii, long before the Roman invasion of 43AD. The Dumnonii (or Damnonii) occupied Devon, Cornwall, and the western parts of Somerset and Dorset. The original Roman Fortress was built at Exeter in AD70 with the City Wall built later around AD200 surrounding the later Civil Settlement. 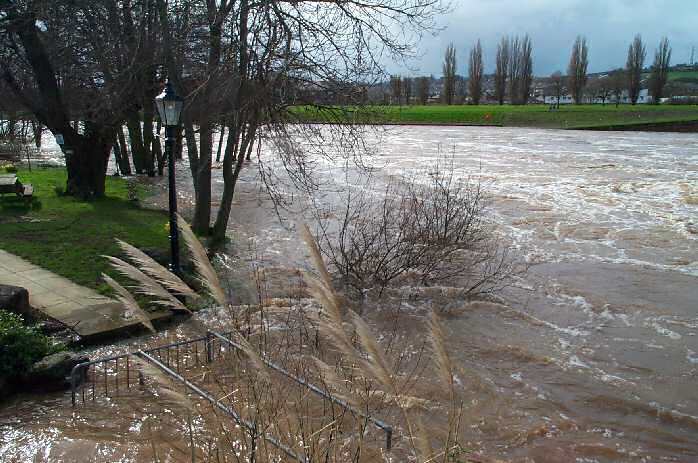 The City was situated on the lowest ford on the Exe, which was tidal as far as the City in those days. It was a good place for the loading of merchandise and was also the centre of a rich agricultural district. The city continued after the Romans left Britain with a siege of the city by the Danes being recorded in 876 and another in 1003. By about 1000 AD, Exeter was the sixth most prosperous city in Britain. It continued to grow and by the 11th century, tin was the basis of the city's wealth. With the arrival of William the Conqueror the city was once again under siege. They repelled the Normans until an agreement was reached whereby they were allowed entry if the citizens were spared. The Normans soon improved the defences building a ring motte and bailey castle on a hill, the rouge mont, in the eastern corner of the city wall. The castle was little used and much was pulled down over the years but the fine Norman gatehouse remains at the entrance to Rougemont Gardens in Castle Street. Within the gardens can be seen other parts of the castle walls, including Athelstan's tower originally built during the 10th century to help strengthen the castle's fortifications. The site of Exeter Cathedral and the area around about has been the heart of Exeter since the earliest days with the the Roman garrison's bath-house being situated in Cathedral Close. 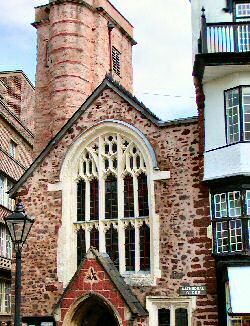 The Cathedral area became a centre of worship in Saxon times with evidence of Saxon Christian burials in Cathedral Yard on the grassy area close to the Devon War Memorial. A minster or monastry was established in the late 7th century has been found in the same area and St Boniface was educated at the minster in AD 680. The Cathedral was begun in the 11th century, but most of what we see today is the result of rebuilding between 1275-1375 with the wonderful West Front being built by Bishop John Grandisson in 1342. Today, Exeter Cathedral is well worth visiting with one of the longest unbroken stretch of Gothic stone vaulting in the world and a clock in the North Transept that dates from 1376. 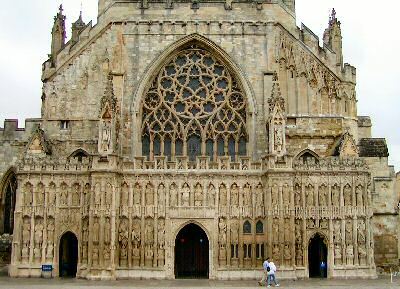 Exeter grew vigorously during the 10th and 11th centuries, but was more of a quiet regional centre during the late middle ages. This changed during the early Tudor period and by 1520 it had returned to being one of the most prosperous English towns. This was based on the Devon cloth industry with Exeter exporting cloth woven in Devon to the Low Countries, France and the Mediterranean. During this time the city was defended against attacks twice: once by the army of the pretender Perkin Warbeck in 1497, and again against the south-western rebels in the Prayer Book Rebellion of 1549. The English War saw the city suffering much damage first defending itself the Royalist side and then, after beingcaptured in 1643, against the Parliamentary side. The city was re-captured in 1646 leaving much of the suburbs laid waste. Much re-buliding took place during the 1650's and by 1660, at the Restoration of Charles II, the city had recovered. It continued to prosper with the flourishing Devon cloth industry exporting much of the cloth to the Netherlands and by 1730 it had reached the summit of its prosperity. However the Devon cloth industry went into decline with the growth of the great industrial towns of the Midlands and the North and by 1830 it was practically vanished. Exeter changed, becoming a county town with much rebuilding of the old medieval city especially towards the end of the Georgian era. Many parts of the city still faced huge problems of disease, especially cholera, throughout the Victorian period and much work was done in improving the water supply, sewers, street lighting and the provision of education to the city's children. Parts of the city remained slum areas until finally being cleared in the 1920's and 1930's. The Second World war saw heavy damage being inflicted in 1942 which led to much post-war rebuilding including the restoration of the Cathedral which suffered a direct hit.